The late 19th century was a time of significant social change. For Dalhousie, it marked the very first step toward gender equality in academia with the admittance of the university’s first female students in 1881. Four years later, Margaret Florence Newcombe earned a Bachelor of Arts and became the first woman to graduate from Dalhousie. Newcombe did just that, becoming a teacher and later receiving a master’s degree in Art History. Each year, McKay’s class of graduating Costume Studies students are tasked with recreating a garment of their choice from a period in history, often focusing on a historical event. Being the 200th anniversary of Dalhousie, 1818 seemed like the logical choice. However, since women did not join the Dalhousie community until 63 years later, 1881-1885 was chosen and students were tasked with honoring the first female students of Dalhousie. Over the course of the term, students used photos or drawings for inspiration and recreated their choice of dress in full using different fabrics and stitching techniques learned throughout the program. Each dress was modeled at a Saturday evening event earlier this month in the Great Hall at the Dalhousie University Club, with proceeds from the event going toward the Costume Studies Scholarship Fund. “While the work you see tonight is from just one class, it is the culmination of four years of hard work and dedication to the costume program,” said McKay at the event. The exhibit featured a selection of 10 day dresses, dinner dresses, ball gowns, and suits all tailored by the students. Each dress served a purpose. Day dresses were worn to the park, or to “be seen” out with a significant other. The hems were shorter to be worn outside, and the styles often reflected the class or marital status of the wearer. Dinner dresses, a more formal garment, were worn to evening events such as dinner parties. Finally, ball gowns boasted longer trains and flashier elements and were worn to formal events. The process of “dressing” was highly technical, and often required more than one helper. Saturday’s event began with a demonstration of the dressing process, from corset to gloves. Bethley Morrison, a Costume Studies student in her final year of studies chose to recreate a day dress from 1883. “It’s the type of dress a young university student may be seen in,” says Morrison. Drawn to the unique pattern and contrasting colours, she had to design and print her own custom fabrics to create the dress. In contrast to the bold silhouette of Morrison’s dress, Melissa Margolese chose a military inspired day dress from 1884. Margolese used only natural materials where possible, and accented the simple bodice with 45 antique mother of pearl buttons. The event coincided with 200 Years of Dress, an exhibit curated by the Dalhousie Costume Society showcasing the evolution of fashion since Dalhousie’s inception. 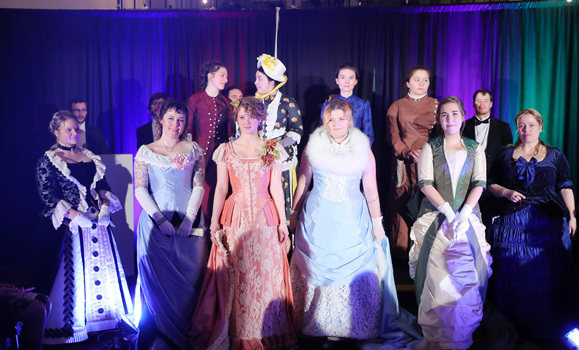 The two events celebrated the success of the Costume Studies program at Dalhousie, and those who have contributed to making it a special place to learn.